In 1632 Galileo Galilei published his Dialogue Between the Two Chief World Systems, in which he compared the two then-competing theories of how the universe was organized: Ptolemy’s geocentrism, which put the earth in the middle of things, and the newer heliocentric concept championed by Copernicus. At the time, Ptolemy’s universe had the backing of centuries of astronomy and ever-more-accurate refinements — such as orbital epicycles — that helped square the astronomical observations with the theory. The Copernican view fit the data but was also deeply counterintuitive. Today, astrophysics is in its own crisis of competing theories. Simply put, there is far from enough observable matter to explain the motion of stars and galaxies. So scientists have inferred the existence of a form of “dark matter” that is not observable via light or electromagnetic radiation, but which has a gravitational effect sufficient to hold the galaxies together and explain their motion. The main alternative explanation for dark matter’s presumed effects is what’s called modified gravity — the notion that the laws of gravitation vary for reasons we cannot yet discover. To prove either case, scientists either need to find a way to see the heretofore unseeable, or change what ought to be immutable. 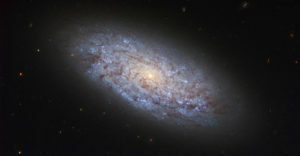 Stacy McGaugh, the chair of the astronomy department at Case Western University, had a hunch that dark matter’s existence could be tested by comparing the behavior of different kinds of dwarf galaxies, clusters of stars several hundred times smaller than the Milky Way. According to our best understanding about the distribution and interaction of dark matter — where it would be and what it would do if it exists — dwarf galaxies that have recently formed as aftershocks between the collisions of other galaxies should have much less dark matter than so-called primordial dwarf galaxies. McGaugh and his colleagues on the project studied previously recorded data on the newly-formed, so-called tidal dwarf galaxies, and made their own observations using, among other instruments, the Jansky Very Large Array of radio telescopes. What they found when they ran the analysis was, in McGaugh’s words, “wonderfully ambiguous.” Dark matter’s presence would affect the rotation of fast-spinning galaxies, but the tidal dwarfs McGaugh’s team was able to measure were all rotating at such a low rate that they had yet to complete a single revolution since the collision that created them. “They’re spinning so slowly that they are consistent with the mass of just the stuff that you see,” he says. “You don’t need dark matter.” But since the newly formed systems apparently have yet to reach equilibrium, it is difficult to conclude anything definitive about either the dark matter or the modified force paradigms. The orbital distribution was not the only surprise from the tidal dwarfs project. “The other really major advance that came out is what we’re calling the Radial Acceleration Relation — this is essentially a new law of nature,” McGaugh says. Acting on a hunch that he had been slowly nurturing over more than a decade, McGaugh directed another postdoctoral fellow, Federico Lelli, to gather up rotation curve data for more than 150 galaxies to plot against the “mass budget” for each galaxy — the ordinary matter expected to be present, based on observed motions and interactions, for each one. Much of that data had been collected using NASA’s Spitzer Space Telescope by McGaugh and a long-time collaborator, University of Oregon astronomer Jim Schombert. McGaugh is well-aware of the irony that his research on tidal dwarf galaxies has thus far provided compelling arguments both for and against the existence of dark matter. “Any project like this should raise new questions, and it certainly has,” he says. Is the way forward, then, a synthesis between the dark matter and force law paradigms? McGaugh is open to the concept but quite wary. The historical example that weighs on his mind goes back to one attempt to resolve the problems Galileo elucidated in his Dialogue. Danish astronomer Tycho Brahe came up with a compromise to allow geocentrism to be maintained in light of the new data: what if earth was still the center of the universe, the sun and moon went around the earth, and the rest of the planets went around the sun?